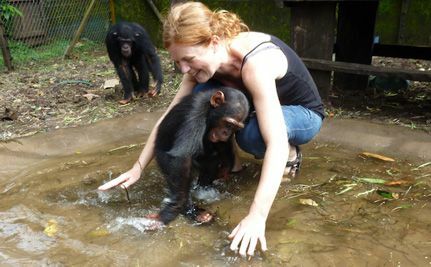 Photo: A young chimp named Mayos and veterinary volunteer Ann enjoy a splash in a wading pool at the Limbe Wildlife Center in Cameroon. NOTE: This is a guest post by Laura Simpson, Founder of The Great Animal Rescue Chase and the Harmony Fund. When the rains fall inside the Limbe Wildlife Centre in the West African rainforest of Cameroon, flooding from the nearby river marbles through the sanctuary like paint on canvas. But the animals pay it no mind as they master the branches of the new climbing structure and have a good roll through the soggy grass down below. Rainy season, after all, is a natural cycle for gorillas, chimpanzees and other animals living here, and for them, the most powerful form of healing often begins in the mud. Since 1993, the Limbe Wildlife Centre has been taking in victims of wildlife trafficking, the bush meat trade and the illegal pet trade. The animals come in from all corners of the forest, some with bullet wounds, broken arms or injured wings. In time each new arrival becomes acquainted with the softer side of human nature as a fleet of care givers and veterinary specialists work to restore them body and soul. Elaborate climbing gyms and cozy rest areas are standard quarters. The chimpanzees and gorillas form social ‘family’ units and they play, nurture and protect one another just as they would in the wild. If you stopped by for a visit on Sunday afternoon you might find mandrills napping in the sun while wooden crates are begin pried open to free hundreds of African Grey Parrots seized at the airport. Baby squirrels who had been thrown into a garbage can are being nursed with bottles, and down by the river, a crocodile is making her return to the river after weeks of recovery from her own captive ordeal. To see more of the Limbe Wildlife Centre’s rescue work, please visit them on the Harmony Fund website or enjoy their blog. Photo courtesy of The Harmony Fund. Thanks to Limbe Wildlife Centre. What a fabulous place!! !These people are wonderful. Animals deserve so much and most humans just see them as $$$$ signs and meat. Thanks for this great Fuzzy feely story on Valentines Day!!! Thank you for helping them! Mud heals a lot of things!